In the Digital Arts and New Media MFA Program (DANM) at UC Santa Cruz, two years of intensive study culminate in the development of individual projects, which premiere in an annual MFA exhibition. In honor of the golden anniversary of UC Santa Cruz and the tenth anniversary of the DANM program, twelve emerging artists have come together to present New Alchemy, a group exhibition exploring various processes of transformation. Alchemy can be defined as "a seemingly magical process of transformation, creation, or combination.” This same definition could be used to describe the artist process, and speaks to science, discovery, and the unattainable. This year’s works include sculptural installations, interactive documentary, playable digital media experiences, and even the recreation of a 1940s shantyboat. 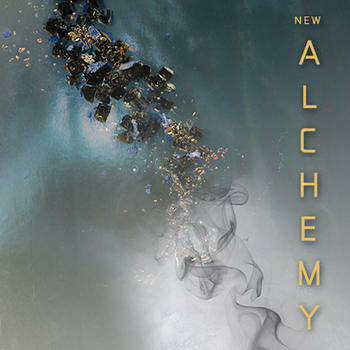 In New Alchemy, transformation is at the core of the artists’ work, and is core to their personal journeys during their two years as graduate students. Jana Bolotin is a filmmaker and media artist. Originally from Moscow, Jana has lived in Jerusalem, New York, Chicago, Seattle, and is currently creating in Santa Cruz, CA. Her works have included mixed media animation, experimental autobiography and commercial documentary. Steve Gerlach began working in live performance at very young age in the rural Midwest. He quickly left the spotlight’s focus and found a calling in production design. Steve’s lifelong pursuit took him off the farm and eventually on to the Great White Way of Broadway. Fulfilling his dream, Steve has branched out to research new technologies and their possibilities in live performance. Kristen Gillette is an artist-designer with a penchant for practical magic and results-driven mischief-making. This usually amounts to a mix of breaking down oppressive systems, challenging dominant narratives, time travel, and/or striving to reimagine and rebuild from multiple perspectives with other rebel rousers in Santa Cruz, the Bay Area and beyond. Joel Dream is a new media artist and inventor currently based in Santa Cruz, California. He integrates mechatronics, projections and immersion into performative architecture and sculpture. Dream's installations have been featured at events in Atlanta, Washington DC, San Francisco, and around the country. Deirdra “Squinky” Kiai is a writer, programmer, musician, and visual artist who creates videogame-like artifacts about gender identity, social awkwardness, and miscellaneous silliness. Recently recognized as part of Forbes’s “30 under 30 in Games”, they are currently completing an MFA in Digital Arts and New Media at UC Santa Cruz. Sean McGowen is a Santa Cruz based artist, whose work focuses on a mix of technology and economics. He has received a BA in Art and Economics, from UC Santa Cruz and is currently studying for an MFA in Digital Arts and New Media. By using his economic education he creates installations which challenge existing theories in a gallery setting. Wes Modes is a Santa Cruz artist who has exhibited his sculpture, new media work, and performance regionally since 1996, recently at the FIGMENT art festival in Oakland and the LAST festival in San Jose. He is also a writer, performer, adventurer and community organizer. Nathan Ober is a new media artist whose work crosses disciplines from installation and performance to video and sound. His current research is focused on astronomy and astrophysics, and deals with techniques of sonification and processes that attempt to expose our innate connection to the universe. Joan Raspo is a filmmaker, artist and educator pursuing a MFA in Digital Art and New Media at UC Santa Cruz. Through a variety of expression—performance, video art and film, Raspo experiments with unexpected processes. She is an award-winning director whose work has been featured in Wired, Times Square Alliance, and The Sundance Film Festival. Alexandra Teixeira Riggs is a new media artist and second year MFA candidate in the Digital Arts New Media program at UC Santa Cruz. Working within the intersections of art, writing, game design and web development, she focuses on creating new platforms (both physical and digital) for interactive fiction, games and new media art. Kelly Skye is a multimedia artist, filmmaker and ecologist. Her work explores expanded forms documentary film and photography that are lyrical and immersive. Her focus is on co-creating visions of ecological resilience based on ideas of embedded interdependence and systems thinking. Her guiding intention is to support community based efforts to restore and protect life-sustaining ecologies. Great photos of the event here and here.